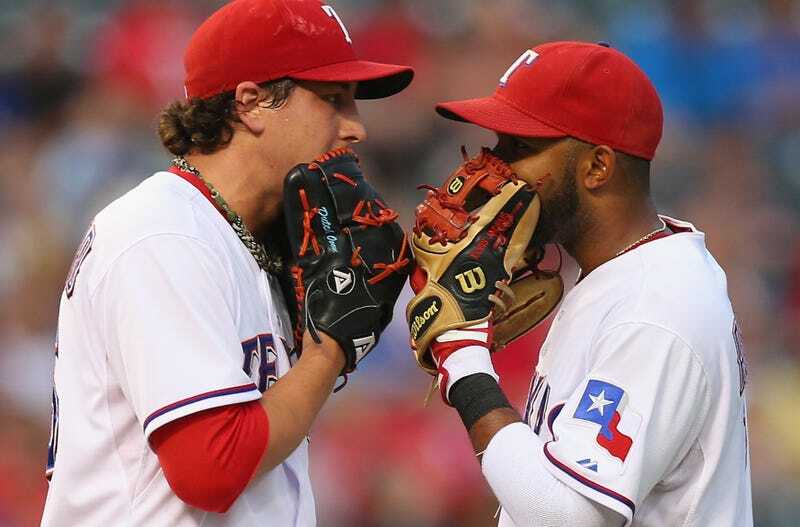 Derek Holland And The Rangers Play A Game Called "Fart Bottle Roulette"
On Wednesday, Derek Holland went on the radio and told listeners of KRLD-FM about a game called Fart Bottle Roulette. I'm going to quote Derek Holland's explanation of what Fart Bottle Roulette is in just a minute, but you already know what Fart Bottle Roulette entails. You do. "Basically, there are two games. One is called pink eye. That is when you just fart in somebody's face and they can't flinch. If they move, there is a penalty for it. This all came from Mark Lowe. 'Fart Bottle Roulette' is when you get a bunch of little water bottles, fart into one of them, put them in a bag, shuffle it, and than watch everybody's reaction. Everybody opens a bottle one by one and it's the most nerve-wracking thing every because you really don't want that bottle." The simplicity of Pink Eye is intriguing, but I'd like to know more about the penalty for flinching. Is it a punch, like in "Doorknob"? Or, maybe you just have to carry everyone's equipment. Fart Bottle Roulette, though, that sounds pretty stressful. Everyone gathered 'round, looking at their mini water bottles full of potentially stinky air, maybe looking around tentatively from the corner of their eyes. Until someone finally cracks, and at once it's a waterfall of plastic-bottle smelling. What if you are last to sniff in Fart Bottle Roulette and bottle after bottle is opened and smells fine? Everyone's relieved faces quickly turn pitying. You know there is a hierarchy of worst smelling farts in the bullpen, too. Aw, man. It's Derek's fart bottle this time, too?